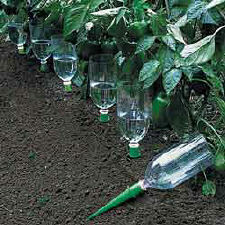 Fit 1-liter bottles for light watering or 2-liter bottles to deeply water thirsty plants. Designed with punch-out holes to control the flow for sand, loam or clay. Available in green for foliage and flower gardens. Patent Pending. Every year when I go on vacation I come back to the most pitiful looking plants. This year I invested in these aqua cones and the garden looks pretty good. They are a bit pricey, but since they are reusable, the price will be worth it in saved veggies come harvest time.